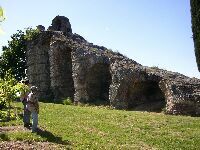 Tunnels, bridges and arcades are means to adjust the trace of an aqueduct to the specific conditions of the landscape. In antiquity aqueducts operated by gravity flow and the engineers normally followed the countourlines around hills and mountains. This may have meant building very long masonry conduits, but it was in most cases cheaper than the alternative: tunnels to cross mountains and hills, substructions, bridges, arcades or inverted shiphons to cross valleys. Where valleys were too broad or too deep and where a detour was impossible or inpractical, one had recourse to a so-called siphon )1. In the pre-Greek eras one had discovered that water in an U-shaped tube in both legs rises to the same level: the law of the communicating vessels. This principle was applied in ancient siphons - as far as we know the first time in the royal palace in Knossos (Crete) - where the water in an open channel was poured into one or more closed pipes. These pipes descended to the bottom of a depression or valley and climbed up the other side to almost the original level. The water was then again transferred into an open conduit following its original course, see drawing above. The most important elements of a siphon are the transition of an open channel into one or more pipes: the influx basin or header tank, the two bends in between hills and valleys: geniculi in Latin, the substructure to support the pipes in the valley: the so-called venter )2 (belly), and the transition of the pipe(s) into the open channel again: the outflux basin or receiving tank. Commonly the pipes in the bottom of a valley were laid down on a siphon-bridge so that the river in the valley could pass below without damaging the aqueduct. The deeper the valley, the deeper was the (static) pressure in the pipes at the bottom. A siphon in a valley of 10m deep contains a water column of the same height which exerts 1 atmosphere extra pressure. The siphon in the Greek (!!) Madradag aqueduct crossing a valley of 200m deep caused a pressure of some 20 atmospheres in the lead pipe, a pressure which equals that in 'modern' steam engines. 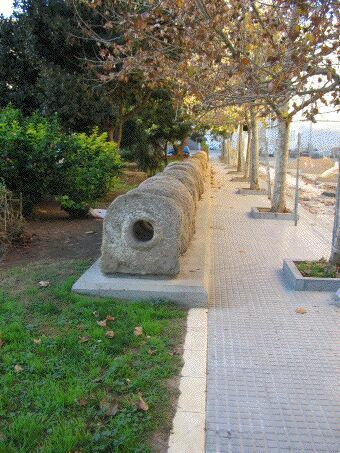 The Greeks often used cut-stone or terracotta pipes and the same applies for the Romans in Spain. In France in particular the Romans used lead pipes. These pipes had a small diameter which were easier to produce than the bigger ones: commonly a series of pipes were applied in siphons with lead pipes. The most striking example is the 8 - 10 pipes parallel in the nine (!) 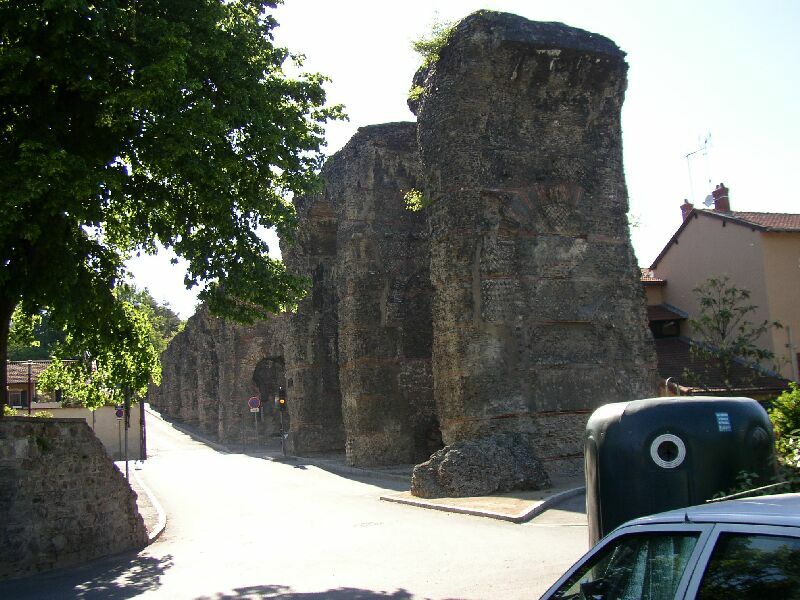 siphons in the four aqueducts of Lyon (France). Another interesting example is the Greek siphon of the Madradag aqueduct of Pergamon (Turkey) where only one lead pipe was applied encased in concrete (??). The Roman Angitia-siphon (Italy) was equipped with one pipe of masonry (!) which is quite exceptional. The application of a siphon was not without problems. One had to be sure that the whole system was 100% watertight, since leaks and / or air-bubbles in the pipe(s) could harm the whole process and make it impossible to start the siphon. A second problem was the high static (and dynamic) pressure on the pipe(s). A third problem could be caused by the accumulation of debris and calcareous deposits (sinter) inside the pipes at the bottom of the valley. In the quotation given below, Vitruvius - a Roman architect from the 1 c BC who left a treatise called 'de architectura' - makes reference to the venter (the lowest part of the siphon) and the geniculus (vertical bend), but he also introduced the tern 'colliviaria' a term which has caused much discussion (see Hodge1983 and Kessener2001). One of its function could have been to let the air-bubbles escape from the pipes. 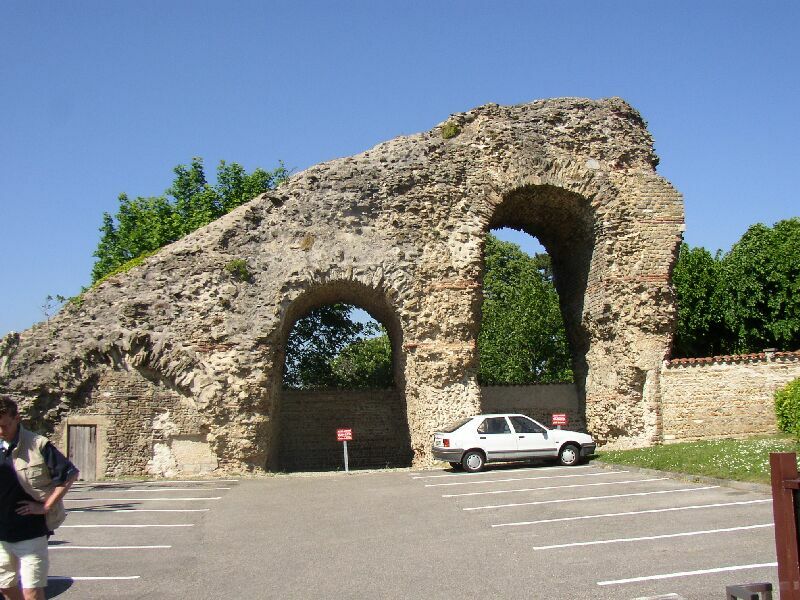 Frontinus is another classical author who wrote about aqueducts. 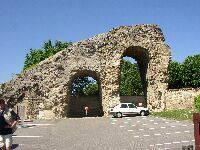 Around 100 AD he was supervising the aqueducts of Rome and wrote the book 'de aquae ductu'. Remarkably he did not make any reference to siphons although in his time they were already applied all over the Greek and Roman world and even in and around Rome. Under which circumstances were siphons applied? In some cases there was no other choice: a detour was impossible or far from realistic. On the other hand: we think that the Romans were reluctant to built aqueduct bridges of more that 50m high (the Pont du Gard in France is 49m high) because of possible stability problems. A siphon was a good alternative. Cost-effectiveness will have been an other major element in the decision process to apply a siphon. Particularly the Greek built their siphons in valleys which were less deep than 50m - maybe because they were already used to stone and terracotta pipes? How often were siphons used? In ancient times people were used to fall back on or near well-defendable hilltops which structurally lacked sufficient fresh water sources. This automatically led to the need for an aqueduct. To overcome the valleys down the hill an aqueduct bridge was built or a siphon constructed, in order to get enough fresh water to the people on the acropolis. The same applies to Roman forts for example along Hadrians Wall, because of defensibility, were built on hill tops too. Therefore the determining factors in favor of a siphon will - among other - have been a combination of economy, landscape and location. The overview below lists some 60 Greek and Roman siphons. Elsewhere on this website literature was collected on more than 600 Roman and Greek aqueducts. This leads to the suggestion that 1 out of 10 aqueducts were equipped with a siphon. )1 Stricktly speaking the term 'inverted' siphon should be used since a siphon brings water over a hill or other obstacle, while an inverted siphon leads it through a depression. )2 Sometimes the word venter is also used to indicate the complete siphon, see Kessener2001. 5. 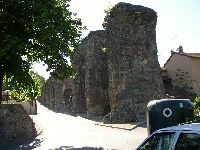 An aqueduct which is made of lead, should be thus constructed; if there be a proper fall from the spring head to the city, and hills high enough to cause an impediment do not intervene, the low intervals must be brought to a level by means of substructions preserving the fall directed for channel aqueducts, or by means of a circuitous course, provided it be not too much about; but if there be long valleys, and when it arrives at the bottom, let it be carried level by means of a low substruction as great a distance as possible; this is the part called the venter, by the Greeks koilia; when it arrives at the opposite acclivity, the water therein being but slightly swelled on account of the length of the venter, it may be directed upwards. 6. If the venter were not made use of in valleys, nor the level substruction, but instead of that the aqueduct were brought to an elbow, the water would burst and destroy the joints of the pipes. Over the venter long stand pipes should be placed, by means of which, the violence of the air may escape. Thus, those who have to conduct water through leaden pipes, may by these rules, excellently regulate its descent, its circuit, the venter, and the compression of the air. Casado1983 Hidraulica 487 + 527 table without lit. ref. Mazloum1936 L'ancienne canalisation d'eau d'Alep Fig 1 Roman? Hodge1983 p192 + n54 Bassel1919?? Mezquiriz1979 1) This bridge is not Roman, 2) is not for Calahorra, 3) and has no siphon. PerezMarrero2012 Two siphons in series. Milas - MYLASA ?? Turkey S76 dus Merckel/vBuren? ?